Production scheduling software makes production planning easy and helps your business to stay on top of production operations. 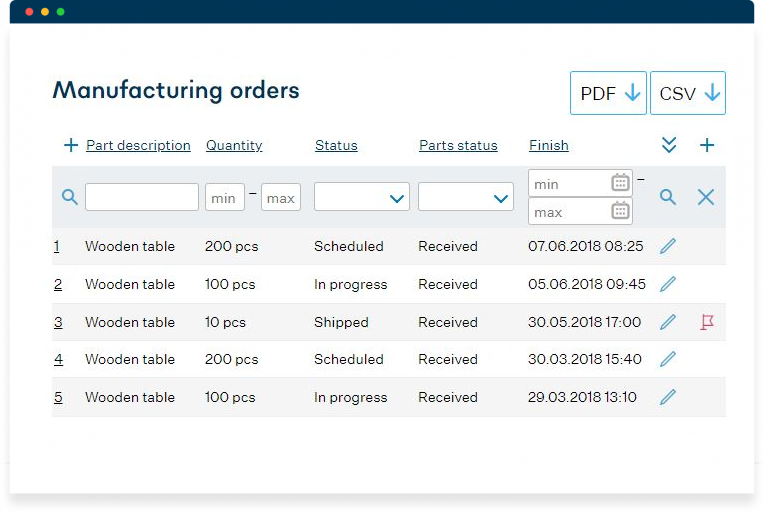 One click to convert a customer order (CO) to a manufacturing order (MO), or just click “Create a manufacturing order” to create it from scratch. 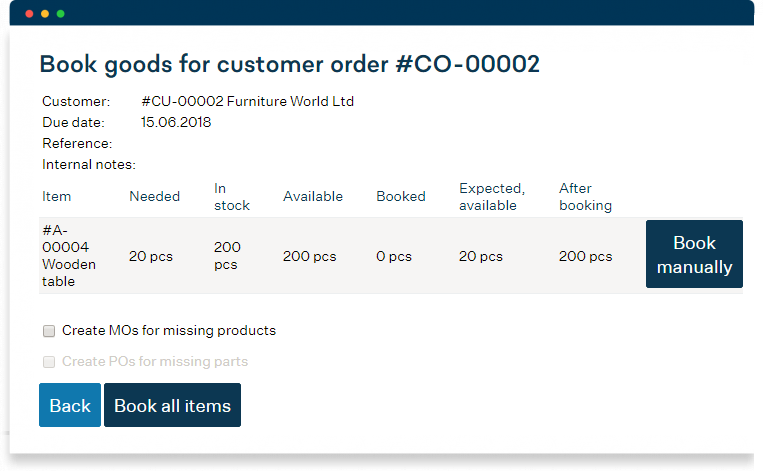 Since the BOM, purchasing and stocking is managed in one place, you can just book the items in stock and automatically raise POs for purchased parts. Having routing and current works managed in one place allows MRPeasy to check the availability of workstations and automatically do the scheduling for you. Follow all your manufacturing operations on one dashboard and stay on top of materials availability, order status, quantity of products and MO start date and finish date. 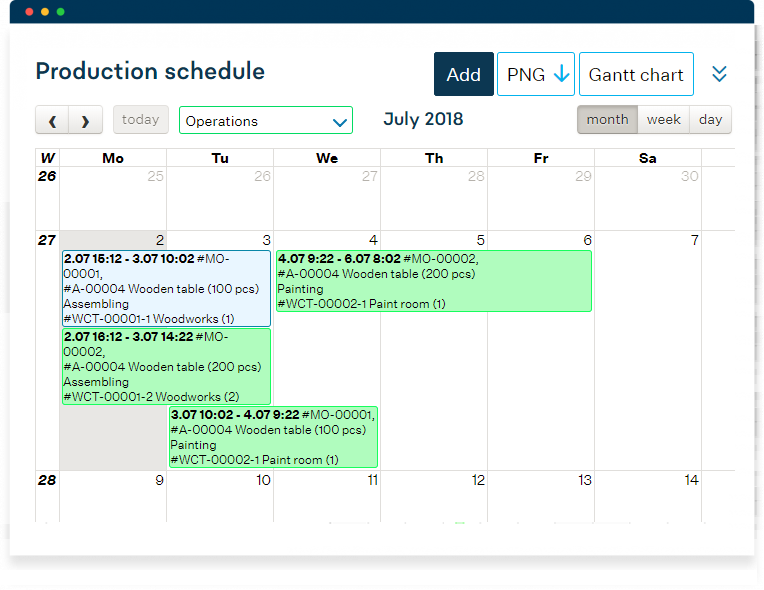 A visual production schedule for manufacturing orders or individual work orders helps the production manager stay on top of the entire manufacturing process. Personal work schedules for shop floor workers and material handlers help the team to stay on top of their tasks, and there is no need for manually updating the schedules. Just drag-and-drop an order to new times and MRPeasy will automatically check resources availability, consider constraints and schedule the order to where it can be done. Alternatively follow your production schedule on Gantt charts and use the drag-and-drop functionality for rescheduling. The whole manufacturing process is tightly connected, so when the customers change orders, vendors don’t ship on time or work orders take more time than planned, MRPeasy helps you stay on top of the process and immediately takes action. The production schedule is color-coded; for example, the red text means that not all materials are allocated + one click to open the manufacturing order to check the details. Allow workers to follow their tasks and do reporting via “My production plan” on a central MES system, via laptop, via tablet or mobile. Have one dashboard to monitor late COs, late MOs, late POs, min. stock, sales performance and more. Accurate automatic planning and realistic production schedule. Reschedule dynamically by just dragging and dropping manufacturing orders and operations in the calendar or Gantt chart. Just a few clicks to calculate the product cost and the best delivery time. Send quotations and invoices, prepare shipments. Send confirmed customer order to production. Track the sales process all the way from quotation right down to delivery using a simple pipeline view. Simple environment for line workers to follow tasks on desktop or mobile device. Real time shop floor reporting. Real time overview on the need and availability of human resources. Manage purchases and raise pre-filled purchase orders with a single click. Vendors, prices, lead times, it’s all there. Manage your supply chain with the help of accurate statistics. Forecast your procurement needs. MRPeasy is simple yet powerful production scheduling software that helps small manufacturers organize production. Just sign up to test MRPeasy, select the features plan that meets your requirements and access additional functionality as you grow your business.